I can sort out rubbish. I can give away my things that I don't want, to friends or to shops. I can paint on paper that I have already painted on before. I can put out the lamps when I go to school. I can play less on my phone so I save money. I can go by bus or subway instead by car. And if I go by car I can go with a friend. ​​We were at this visit with the school at an art museum called Liljevalch´s museum, at an exhibition called Utopian Bodies, which showed us what we wear, what the future clothings are and what we do when we make our clothes. The first part of the exhibition were clothes standing on wooden beams, to show what you can do with recycled clothes, for example; one clothing was made with glass as crystals at the collar on the dress. This shows us what we can do with recycled materials, like glass as showed in this exhibition. In the next room, we found and were introduced to clothes with just bizarre clothings like a hat with (I hope) dead mice glued on top of it. It was horrific and we didn’t realize what just hanged to the left of us: Two legs of a horse…used as SHOES! What happened to fashion? Now, it’s good that they take the whole horse when they carve out the meat, but we don’t like to eat horse meat in Sweden anyway, so we think it´s absolutely horrible that they even cut out the hooves from the horse. In the final exhibition we saw a dress with a heart, showing the love in the room. Whenever someone came very close, the heart of the person to the right kept beating faster and faster. It was a bit scary, but it showed that love can be embarrassing. To get a better environment in the future we need to do this. · Step one, recycle most things we have instead of throwing it. Don’t use too much papers because if you use too much we don´t need to take down new trees. · Step three, if everyone could use their cars just twice a week, I think the environment could be better. So if everyone on Earth did these three things I think the environment could be better. We want to have an impact on the viewer! Let the world be a good place when we are adults. 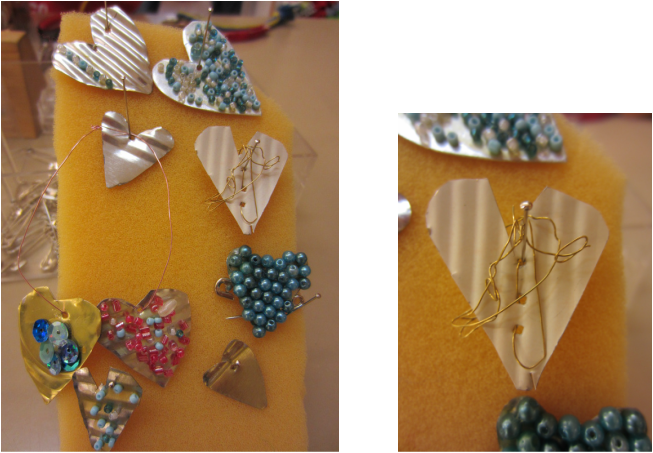 Year 4 and 5 created Valentine hearts from old tins. New things made from old clothes. A skirt from a dress, a pair of shorts made out of two T-shirts and a bag from a pair of jeans. An apron from an old skirt and an owl from an old sweater. A snake from a T-shirt. 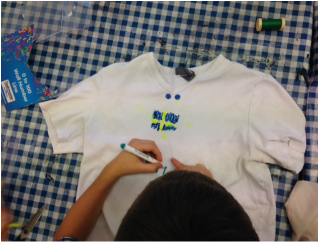 Year 2 at Björngårdsskolan brought their old T-shirts to school and created new ones. They used pearls, buttons and textile crayons to make them look new again. 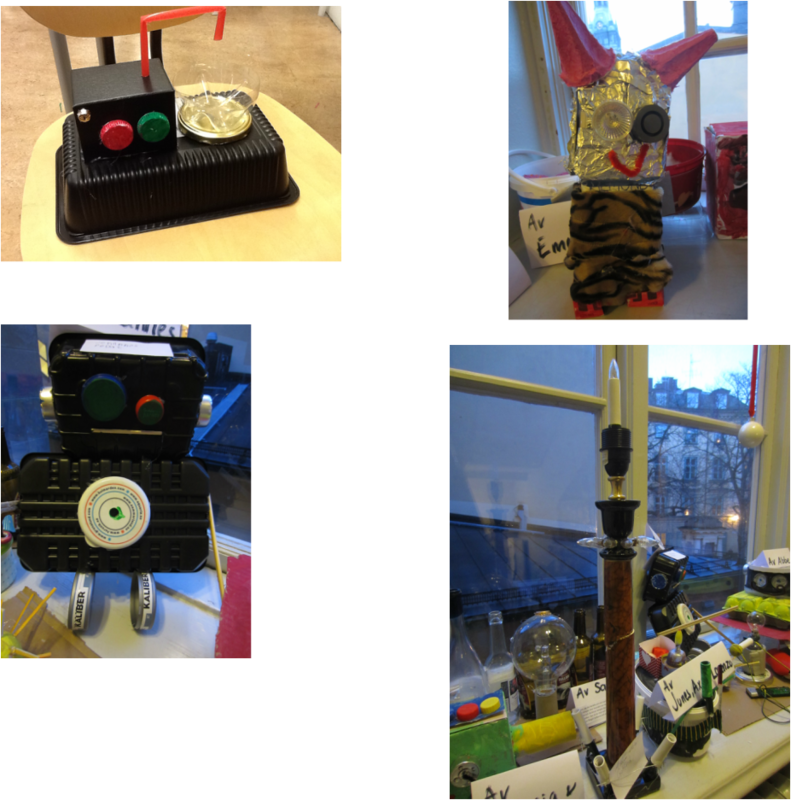 During the Nobelweek, students created new things from rubbish.